Karela, the most hated veggie right from my childhood. The same scenario I find it now with my son. But knowing the health benefits I continue to cook it more often in my kitchen. Karela is also known as 'Hagalkai' in Kannada. Just because of its bitterness, its disliked and most neglected veggie. But its highly recommended for diabetic patients. I have seen some having some sweets at parties and their next day menu back home is Karela. That's the way life is. Can't stay away from sweets for too long. 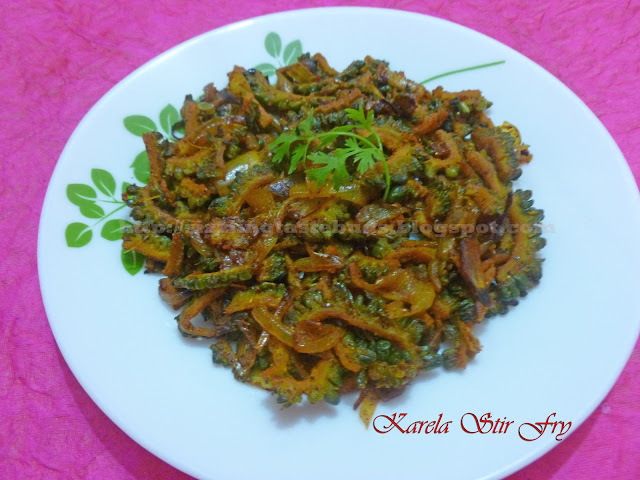 This Karela Stir fry is very easy to prepare and really tastes far better than we think it should. Don't give excuses and do try it out. Here's the simple recipe of Karela Stir fry. 1. Wash the bitter melon and cut into halves. Remove the seeds and cut it into thin slices. 2. Add some salt and 1/2 tsp haldi to the sliced bitter melon. Leave it untouched for about 1/2 an hour. 3. After half an hour, you will notice some bitter water left out from bitter gourd. Wash it with water and squeeze out the water and transfer the squeezed bitter melon to another bowl. Step 2 and Step 3 is to lessen the bitterness of the bitter gourd. You are always welcome to skip these two steps. 4. Heat 1 tbsp oil in a frying pan and add sliced onions. Fry till it turns slightly golden in color. 5. Add ginger-garlic paste and saute it for a minute. 6. Now shift the squeezed bitter melon to the frying pan and give it a stir. Close the lid and cook it in a low flame without adding water. Keep stirring in between. 7. When its half cooked, add in all the dry powders like dhania powder, red chilli powder, Haldi and Salt to taste. Sprinkle some water if you find the mixture too dry. 8. Close the lid and cook till its done. Lastly add some jaggery syrup and mix well. 9. Healthy and tasty Kerala Stir fry is ready to be served.